Andrew Cuomo, seen here in charge of the MTA, has required an emergency Board Meeting to review his L train plans. Never one to accept not getting his way, Gov. Andrew Cuomo this weekend arm-twisted the MTA into holding an “emergency” Board meeting on his L train plan. Despite the fact that there is no real emergency and despite the fact that the MTA told its Board members of the meeting just 30 minutes before sending out a press release, Cuomo just had to exert the control he holds over the MTA to get what he wants. Now, in the face of a press growing more skeptical of his plan by the day and while trying once again to cast doubt on his firm control over the MTA, the transit agency’s governing body will meet on Tuesday to be briefed by the engineering firm WSP on the proposal. The MTA Board will not vote yet on the plan and may opt to hire an outside consultant to fully vet the plan, but Cuomo gets his way on the MTA yet again with an “emergency” meeting so Board members can sit there and listen. When Gov. Andrew Cuomo forced the MTA to cancel the L train shutdown via a PowerPoint promising a better plan, he seemed to want to be seen as the savior of Brooklyn, the one to ride to the rescue of a beleaguered city facing a true transit crisis. At first, with the tabloids showering him with kudos, his team even took a victory lap before the good press evaporated. Bianco comes from the Transportation Industrial Complex Cuomo has railed on of late, but as Cuomo’s new L train proposal is being prepared by the same company that prepared the shutdown plans, I’m not sure how we can take seriously Cuomo’s attempts at defining and attacking this complex. But back to Bianco: He has no stake in the matter other than reputational. He retired from Transit three and a half years ago and currently works as a solo safety consultant. Does that leave him more credible or less? I’ll leave that up to you, but he’s not the only one urging careful consideration of the plan. NYC Transit President Andy Byford, toeing that line between heeding Cuomo, his boss, and advocating for the MTA, stated various to Community Boards and Brian Lehrer that he will not go forward with Cuomo’s plan until it has been vetted by an outside consultant. Questions remain regarding the impact of silica dust on the new plan and whether the feds will approve the new plan. But the board meeting must go on, and Cuomo must show his actions carry the day by having the MTA Board, which has never yet turned down the governor who controls the MTA, meet, and so they shall meet. Not content with forcing a meeting Board members and MTA officials thought unnecessary and premature, Cuomo has reengaged on his years’-long disinformation campaign regarding MTA control. Simply put, he keeps lying about MTA control. As you, dear reader, know, the governor — in this case, Andrew M. Cuomo — is in charge of the MTA. He directly appoints six of 14 Board members but is also responsible for approving the recommendations of those county and city officials who name the other eight. In fact, he held up Ydanis Rodriguez’s attempted appointment a few years ago over concerns of conflicts of interest (prior, of course, to appointing Joe Lhota and his multiple jobs to the top spot at the agency). The governor also names every top official at the agency and often steps in on lower level hires. He is very much legally and apparently in control of the MTA. On the top of the list on the city agenda is going to be the MTA. This is madness. The MTA was created in the ’60s. It was designed to make sure no public official had control or accountability because it sets fares and no politician wanted to be near setting fares. So it was this convoluted – you have a board, I have six votes but it’s a 17 member board but the Speaker has a unilateral veto but the Senate leader has a unilateral veto but the Mayor has a unilateral veto. It is just a dysfunctional organization, and that has to change. It took me a while to decipher this word salad, but Cuomo is effectively conflating two distinct bodies here. There is the 17-member MTA Board that oversees the agency and a separate four-member Capital Program Review Board that nominally signs off on the MTA’s multi-billion-dollar capital plan every five years and does little beyond that. The CPRB has no bearing on the day-to-day operations of the MTA which the governor controls, but he’s trying to confuse the issue. As the Governor has said, and repeats this legislative session, if the Legislature gives the Governor authority, he would accept the responsibility. But he would only take responsibility with authority. Basic executive authority would be a majority of the Board appointees, no independent unilateral vetoes of the budget by other elected officials, and hiring/firing and organizational authority. Nothing could be more reasonable, and no credible executive would require less. No other Governor or Mayor has ever been willing to accept responsibility. History shows most work to deny connection with the MTA altogether. The Governor will step up, even if not politically in his own best interest…In short, the Legislature should pass congestion pricing and require the City and State to split any funding shortfall and also give the Governor operational responsibility. It’s dangerous and foolhardy to tie congestion pricing in with MTA reform because if the latter fails and drags down the former, the entire region will be facing a crisis of mobility. It’s disingenuous to call for full control over every facet of the MTA when one already has that control while also claiming the city should pay for half of any funding shortfall. The governor wants even more power so he doesn’t have to face checks on his ability to set the agenda (which he barely does anyone) while twisting even more dollars out of the city which will have no say or ability in ensuring these dollars are spent on city, rather than suburban, projects. It’s a scam, not a reform effort. I’ll come back to Mujica’s statement later and especially his claim that the MTA doesn’t pass its own budget. This is again an attempt to create confusion around the two MTA budgets — capital vs. operating — and how they work to complement each other. Until Andrew Cuomo attempted to shirk on his duties to the MTA, no credible executive of the state ever to argue his way out of MTA control and none have distorted history and legislative meaning as much as Cuomo as his team. He is in charge; the MTA is his; and everything about the L train shutdown just serves to underscore this reality. One person is in charge of this mess the MTA is in; one person has presided over the decline of the transit system. That person is Andrew Cuomo through and through. Gov. Cuomo sits with interim MTA Chair Fernando Ferrer and deans from Columbia and Cornell during last week’s L train announcement. When Gov. Andrew Cuomo held an impromptu press conference on Thursday essentially canceling the L train shutdown and torpedoing years of advance planning in the process, he thrust his MTA and his administration headlong into a credibility crisis. It certainly wasn’t Cuomo’s intention to do that; he clearly wanted to be seen as the governor-slash-hero whose attention to infrastructure innovation cast him as the savior to New Yorkers gearing up for 15 months of transit headaches. But through the way he handled the announcement and his comments afterwards, the fact that his plan is currently just a set of bullet points, and the way he didn’t involve the MTA or public in his decision, he has created a situation where neither he nor the MTA can be trusted, and it’s going to take years for anyone involved in this to recover public trust. The MTA’s credibility crisis has been decades in the making, self-imposed by an agency that can’t even do something as simple as rebuild a staircase on time. It’s hard to pinpoint exactly why the MTA started losing the public trust since many would argue the agency had never earned that trust to begin with. The charge that the MTA kept “two sets of books” was one that lingered for years, even after it was debunked in court, and the agency’s inability to finish any project, whether a basic station rehabilitation or a massive capital project, on time or on budget has long been a public punch line. East Side Access, after all, was once supposed to cost $3.5 billion and be open by now, and that’s just one example among hundreds. Lately, as the MTA has struggled to deliver on basic technological enhancements, the wheel-spinning has turned into the agency’s dirty laundry, aired publicly. The MTA has talked about the Metrocard replacement project for so long that no one really believes the upgrades are underway, for instance, and the current jury-rigged countdown clocks (also imposed by Andrew Cuomo) are a daily reminder that people don’t trust the MTA. On Friday, while heading from Midtown, I checked the MTA’s app at 9:39, and it told me a D train would be arriving at 9:42. At 9:42, that train was scheduled for 9:44; at 9:44, 9:46; at 9:46, 9:49. It arrived at 9:48, a time not once projected by the app. The MTA blamed a work train, but this is far from an isolated incident. On a daily basis, riders report countdown clocks that aren’t right and arrival times that come and go with no sign of a train. If the MTA can’t get this standard transit technology right and can’t provide reliable arrival times to the public, what can they New Yorkers trust them with? Politically, before his departure, Joe Lhota earned headlines and the ire of good governance groups for his perceived conflicts of interest as he held multiple jobs at once, casting doubt on his ability to be a partial and fair leader for the MTA. Could New Yorkers always trust that Lhota had their interest and the MTA’s interests in mind if he was also serving as head of a hospital and on the board of Madison Square Garden? Transportation is such an ingrained part of every NYC life, after all. The L train, and Cuomo’s machinations, is now a direct challenge to any public trust in the agency. For three years, the MTA has engaged in numerous public meetings, rehashing over and over again the need to shut down the 14th St. tunnel in order to rebuild the bench wall, reconstruct the track bed and replace ties and the third rail. A tunnel shutdown was the only way to accomplish the scope of the work the MTA said they had to achieve, and the choices were either a full shutdown for 15 months or a partial tube-by-tube shutdown that would have lasted closer to three years. Until last week, no one had ever suggested that the MTA could simply let the bench wall be while installing cables elsewhere and doing the minimum to shore up the tunnel without closing it down. When Cuomo did it, he cast doubt on the MTA’s ability to assess projects holistically and consider all viable alternatives, including new ones. Since the announcement, the MTA deleted the special section devoted to the L train shutdown from its website. Even before the MTA Board, which must approve the new project, holds a meeting to do so, the MTA is trying to erase this history and three years worth of planning. To many in New York, this original lack of creativity and ex post whitewashing attempt is indicative of the MTA’s inability to see beyond what consultants tell them or what their management determines. If they can’t present all options — if they can’t consider a world in which a shut down can be avoided but the Governor can at nearly the last minute — why should we trust them with anything they say? Over the weekend, this skepticism and the credibility gap manifested itself very clearly via social media. Jim Dwyer of The New York Times had Multiple Twitter threads (here and here) about the issue, and City Limits penned an article on the very same topic. Others questioned the MTA’s ability to ensure the enhancement work that was going to be performed during the L train shut down would continue. I don’t blame anyone for questioning or denying the MTA its credibility. I responded to Dwyer with a Twitter thread of my own, but his complaints get to the heart of the issue. Nothing the MTA says will be trusted until they start delivering on their promises, and little they can do today or tomorrow will change this perception. But he’s not the only one with credibility issues, and the Governor — who, dispute frequent protestations, does actually control the MTA — has next to no credibility at all. For three years, the MTA has been very public in its planning, and for three years, Cuomo has said next to nothing about the issue. He claims someone in Brooklyn came up to him, grabbed him by his lapels (without being instantly removed by security) and yelled at him to do something about the L train. This story, as I’ve said in the past, reeks of political poppycock. Cuomo probably heard from his staff and his donors that the L train shutdown was shaping up to be a nightmare, and so he stepped in with a few academic friends he could rustle up. Why wasn’t he involved for years with the biggest story and most comprehensive public mitigation effort impacting the MTA we all knows he controls? And why should we trust Cuomo on transit after all? His big-ticket projects show a keen understanding about form over function. The Laguardia and JFK rehabs do not involve adding more runways, the biggest problems facing New York City airports; his backwards AirTrain is, well, backwards; and after years of careful planning and advocacy work, he torpedoed a real transit link on the Tappan Zee replacement at the last minute. Even his meddling on the Second Ave. Subway wasn’t welcomed by everyone as a few sources tell me his push to wrap the project by the end of 2016 both cut corners and cost the MTA significant money. Cuomo’s office confirmed that only one of the eggheads on the Ivy League panel, which the governor touted as “the best experts we could find,” has limited experience working on subways. And that one person, Cornell professor Thomas O’Rourke, struggled to name a comparable subway tunnel-rehab project he had been involved with. “Rehabilitation for subway tunnels? Mostly new construction for subway tunnels,” O’Rourke said…Meanwhile, the team never bothered speaking with subways boss Andy Byford and made just one trip, on Dec. 14, to the crumbling Canarsie Tunnel to see the problem for themselves, Boyce admitted. In comments to The Times, Veronica Vanterpool, a Bill de Blasio appointee to the MTA Board who is one of the members of that body willing to question both the MTA and Governor publicly, expressed her concerns as well. “The original proposal would have fixed and repaired the tunnel for 50 or 60 years. It’s not clear to me the longevity of this solution,” she said, adding, “This continues to show that the board is essentially an afterthought. We’re not consulted, we’re not briefed, but yet we’re expected to move important projects along.” Comments from others in the article too show that no one knows who to believe any longer. Ultimately, ten bullet points on a PowerPoint presentation without a full scope or an independent assessment of the efficacy of a plan do not constitute a fully-baked project, and Cuomo’s insistence that this plan is better the original and sufficient isn’t a claim anyone is in a position to assess because there is no plan yet. To push this point, Cuomo on Friday called for an emergency meeting of the MTA Board, but MTA Board members haven’t gotten word of such a meeting yet. Likely that’s because a meeting — and more importantly, a vote — can’t happen until there is an actual plan and the MTA knows what it’s asking its contractors to do. Maybe this is better, but right now we just don’t know. And for eight years, Cuomo has given us no reason to trust him when it comes to transit or last-minute meddling. Railways are ultimately a conservative business. If something goes wrong, trains derail, and people die. It’s why planning takes longer than a few weeks and why the initial reaction to Cuomo’s move has been one of shock, outrage and pushback. “Move fast and break things” hasn’t exactly done wonders for the tech industry, and it’ll go over even worse in transportation. Unfortunately, that’s what’s happening, and by wading in so carelessly, Cuomo has thrown doubt on his ability to lead through a crisis and the MTA’s ability to plan thoroughly, comprehensively and correctly. The crisis of credibility will far outlast whatever work ends up happening on the L train, and that’s a real cost New York City will have to bear. 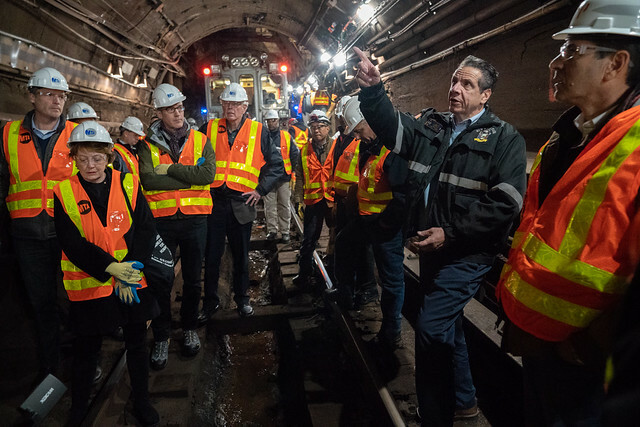 Governor Andrew Cuomo and his team of experts toured the L train tunnel last month. On Thursday, he torpedoed three years of careful planning. After an impromptu tour of the L train tunnel last month and three weeks of consultations with engineering professors from Columbia and Cornell Universities, Gov. Andrew Cuomo ordered the MTA to cancel the impending 15-month shutdown of the L train tunnel between Brooklyn and Manhattan. Instead, the scope of the necessary repairs will seemingly be reduced, and per Cuomo’s orders, the remaining work will proceed on a 15-20 month schedule that maintains regular weekday L train service and relies on single-tracking (and 20-minute headways) during nights and throughout the weekend. It’s a drastic shift in scheduling and scope, and while tentatively welcomed by Brooklyn residents on the precipice of a 15-month transit nightmare, it threw years of careful planning by the MTA and NYC DOT as well as tireless work by advocates fighting for a transit-first redesign of New York City streets into disarray, all just three months before the shutdown was to begin. At its core, the move is quintessential King Cuomo. Sounding very Trumpian, Cuomo, who ended his press conference by saying, “No, I am not in charge of the MTA,” spent over an hour on Thursday touting his “panel of the best experts we could find” and came up with a plan in three weeks that remains underdeveloped and untested. At best, it will kick the can down the road; at worst, it will fail, costing precious time and even more money. No matter what, everyone involved with the L train shutdown I’ve spoken with today agreed that at some point in the near future, whether it be 10 or 20 or 30 years down the road, the MTA will have to rebuild the L train’s 14th Street tunnel. Cuomo’s plan isn’t well developed. The MTA had published hundreds, if not thousands, of pages of studies, presentations, reports and analysis regarding the L train shutdown. The governor has hosted one rambling, long press conference and issued a thousand-word press release on his new plan. The governor who has spent years sucking up the oxygen in the room claiming he doesn’t control the MTA swooped in at the last minute to unilaterally impose new plans on the MTA. He did this without consulting anyone involved in planning the work or the community groups on the ground working to ensure a mitigation as smooth as possible. This is Cuomo, in control, with only his own ideas and no one else’s guiding him. We don’t know when the work will start in earnest, what the cost will be, how it’s being scoped, or what mitigation is required. We don’t know what’s to become of plans for a 14th St. transitway, bike lanes throughout Manhattan or a bus bridge over the Williamsburg Bridge, all of which had significant value to a transit-oriented future for NYC in their own rights. We know outlines and aspirations, and I’ll try to distill them down in this post, raising questions at the end. There’s more to be said over the next few days as I arrange my thoughts on this topic, but it’s fair to say Cuomo, without any community outreach and no warning to the MTA Board, changed the conversation in one fell swoop today. Whether it’s for the better remains to be seen. What is Governor Cuomo’s new plan to repair the L train tunnel? At a high level, Cuomo’s plans appear simple because the details haven’t been fleshed out yet, and the main thrust of the work involves the ducts. The bulk of the work necessitating a full-time shutdown of the L train focused around the so-called bench wall that carries cables through the tunnel and serves as an emergency exit pathway. Because of saltwater intrusion, the MTA planned to chip out and rebuild the entirety of four bench walls in the two tunnels. Instead, under the new approach, the MTA will use a rack wall to run new cabling and other required systems through the Canarsie Tunnel above ground level. This is generally how cables are fed through tunnels in other cities, and the bench wall remains a relic of the early days of NYC subway construction. 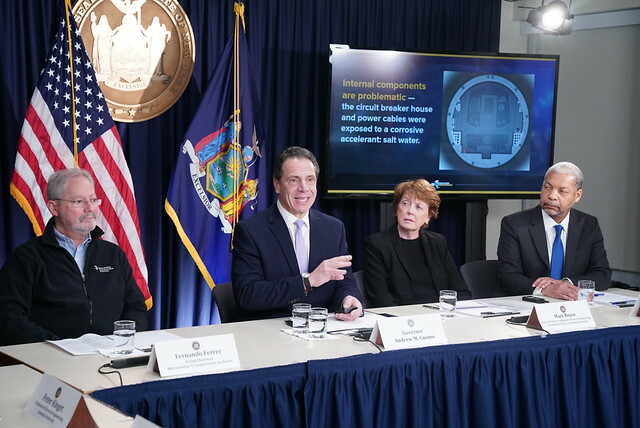 Mary Boyce, Dean of Engineering at Columbia University and one of Cuomo’s experts, spoke at length about the plan to “rack” cables on the side of the tunnel while abandoning old cables in the benchwall and leaving the benchwall in place unless structurally unsound. We are recommending that the cables be wrapped. So the majority of the cables, the power cables, the communications cables, control cables that power the train, the pump, the fans, that these be wrapped along the walls on one side. This leaves the other walls free for egress and access. We’ve looked at many challenges with actually doing this and different ways to actually wrap these cables, and we have found that it does indeed seem to be possible. We will also place the negative return on the track bed. So what this is essentially doing is decoupling the cable system from the benchwall. These are two different functions. We are able to execute all of the functions of the cables without them being in the benchwalls. So we do not give up or sacrifice any functionality of the system. An important thing that we have to address is making sure that the fire retardancy is still possible for these cables, so the cables must be jacketed and they’re jacketed with a low smoke zero-halogen fireproof material. This is a proven technology, it has been used in these newer designs and newer modern tunnel systems. It’s also used in aircraft. So what happens with these jacket cables is that, yes there’s some sort of thermoplastic or thermostat, but they have an inorganic filler so they char in the presence of heat or fire, so there’s no outgassing and they actually become even better insulated. So this is another key feature of being able to wrap these cables on the wall and not embed them in the benchwall. This also very importantly means that we can abandon all the old cables in the benchwall. We do not need to remove them and replace them, we just leave them there. So if a benchwall is still structurally sound, we do not need to destroy it, remove the cables and rebuild it. This is a very key factor, okay, because it significantly reduces demolition and construction, and we feel probably has a cost implication as well. There’s benchwall, that’s going to, in some sense, be stable and remain. There’s benchwall that’s been compromised to some degree, but not significantly. That we think we can reinforce using something called ‘fiber reinforced polymer’ – so it’s essentially a mixture of epoxy and fiber to wrap around. This will last for decades, for a long period of time. It’s not a quick fix. It’s technology that’s been widely used in bridges, in buildings, so we’re simply applying it in a very different application here. And then there’s a third category which is benchwall that really is just not structurally sound that has to ultimately be demolished and removed. Then the question becomes, how do we know what’s what and so we’re going to use a state-of-the-art ultrasound technology to evaluate the entire length of the benchwall and figure out, you know, which parts of the benchwall are in which categories and act accordingly to either leave it as it is or to reinforce it as needed, or remove it as needed. And what’s important is that the benchwall is really serving the primary purposes – it’s back to its primary purpose which is access and egress. It’s no longer serving any role with respect to the cabling, so that’s the only element we have to ensure in terms of functionality that we have retained. Why didn’t anyone come up with this sooner? What’s the actual state of the L train tunnel? I’d also urge you to take a look at this video of the Canarsie Tube the MTA posted in 2016 (embedded below). Particularly, note the bench wall at the 57-second mark and the concrete between the railway ties at around the 2:59 mark. In multiple places, you can spot brackets holding up the bench wall, and those who were close to the original assessments of the Canarsie Tunnel tell me that Cuomo’s move to use polymer will result in more work and more disruptions in a few decades rather than a rebuild a la Montague which would have ensured five decades of continued use. Without a better sense of scope, it’s premature to know what mitigation is required or when. Most politicians and advocates have bemoaned Cuomo’s attempts at circumventing a careful process and urge the MTA to involve all community groups in presenting updated options, including guaranteeing sufficient mitigation plans. Interim MTA Chair Fernando Ferrer noted that G, M and 7 trains will still see added service (though the 7 train upgrades are due primarily to CBTC). As I mentioned, the future of the other mitigation work is foggy. This is worth a separate post later on so I’ll come back to this. Will the MTA still be able to conduct extensive work at Union Square to improve platform access? The MTA was planning to piggyback significant work onto the L train shutdown. Without trains running constantly, the agency could build a new entrance to the 1st Ave. station at Ave. A, replete with elevators, add ADA accessibility features to other stations along the L in Manhattan, widen and rebuild staircases at Union Square, and implement badly-needed power capacity upgrades to ensure more trains could run per hour. The agency says all of these projects will continue, but it’s not clear how Cuomo’s meddling interferes with this work. Can these projects be finished without substantial disruption to the limited service? Will it take longer than 15-20 months to complete this work? And how can the agency close staircases at Union Square while operating heavily overburdened L service? These are questions Cuomo and the MTA could not answer on Thursday but must be addressed soon. Should we trust anyone here? Not in the least. Although the MTA earned the benefit of the doubt by rebuilding the Montague St. Tunnel and has a good track record on completing Sandy-related repairs, the agency has not been able to manage large-scale projects or implement outside-the-box thinking. The governor, meanwhile, has shown no willingness to participate in careful and deliberate community outreach processes, and despite his statement yesterday that “I educated myself to the best extent possible,” the governor has spent barely a month on the L train shutdown. His past record of meddling with transit led to cost overruns on the Second Ave. Subway and a New Tappan Zee Bridge without the transit options advocates desired (or a clear sense of costs). I could spend another 600 words writing on this topic, but there is, simply put, little reason to trust this process right now without substantially more detailed answers to a variety of questions. This too is an open question. To step in at the last minute with a radically different approach based only on the ideas of a few consultants is very much in line with Cuomo’s governing strategy, but as I keep saying, it leaves much to be desired from a procedural perspective. I’ll try to explore this further as well. This post is heavy on the skepticism and for good reason, and I didn’t even get to discuss Andy Byford’s apparent resigned acceptance of this approach and his near-total absence from today’s press conference. There’s just so many moving parts here. Despite the belief that NYC DOT’s mitigation plan wasn’t going to be sufficient for Day One, the MTA and DOT had spent years collaborating on plans for a very disruptive shutdown, working to get political buy-in at every level of the community. Cuomo has shred every ounce of goodwill that may have existed for a project that we just can’t assess yet. Maybe this is the way to reform MTA thinking and MTA practices. Maybe this will work. But maybe this is Cuomo shooting for the stars (or at least 1600 Pennsylvania Avenue), and maybe we shouldn’t be rushing into vital infrastructure repairs using unproven technologies without testing them on non-critical infrastructure first. Maybe in 10 years or 15 years, we’ll be back here facing optical sensors no one at the MTA bothered to maintain and a collapsing bench wall that leads to a derailment in L train service (as happened to the G train). Maybe we’ll get to go through this all over again when someone else is Governor. One way or another, Gov. Cuomo, in trying to be the hero, showed extreme disregard for the travails of Brooklyn and Manhattan and the communities gearing up for the L train shutdown. It might be better this way; it might be worse. We all deserve to know more about the details of the plan, how it will work, and why Cuomo waited so long (or the MTA never followed this route) in the first place. Too much time and effort went into considerable deliberations for Cuomo to impose his will at the last minute without careful planning, outreach and analysis. Ed. Note: This post was originally titled “Gov. Cuomo to order MTA to lengthen L train work, inconveniencing everyone for longer.” I’ve updated the title to reflect the comments from the governor’s press conference. More updates are coming. Governor Andrew Cuomo admires the L train tunnel just months before a full shutdown for Sandy repairs was set to begin. After an impromptu tour of the L train tunnel last month and three weeks of consultations with engineering academics from Columbia and Cornell Universities, Gov. Andrew Cuomo ordered the MTA to cancel the impending 15-month shutdown of the L train tunnel between Brooklyn and Manhattan. Instead, the necessary repairs will proceed on a 15-20 month schedule that maintains regular weekday service and relies on single-tracking during nights and weekends. Instead of a full benchwall chip-out and rebuild, the MTA will use what Cuomo and his experts referred to as a rackwall to run new cabling and other required systems through the Canarsie Tunnel. It’s a very Cuomo-ian roll of the dice as this technology is unproven as to its application in subway tunnels but has been implemented in other contexts successfully, but for now, it seems the scope of L train work is posed to change significantly, raising more questions and concerns. Updates to follow. The original post follows below. Exercising his control over the MTA last month, Gov. Andrew Cuomo dragged a bunch of academics who aren’t really experts in MTA construction project management into the L train tunnel for a last-minute inspection stunt to see if the upcoming shutdown could be shortened. It wasn’t immediately clear why Cuomo got the bug, three years into extensively planning for the project and four months before the shutdown, to intervene. In various iterations of a story, he claimed people on the street were coming up to him on the street to urge him to do something. And now he has done something that is going to make the required Sandy repairs on the L train worse and longer, against the wishes of the overwhelming majority of L train riders. News of Cuomo’s meddling first broke when Transit Center tweeted out some rumblings this morning, and the development has been confirmed by The New York Times. We do not yet know the shape of the new project, but the full 24/7 shutdown will not begin in April and will not last 15 months. According to a report on Gothamist, Cuomo may force the MTA to change the 15-month plan to a three-year project with more work shifted to nights and weekends and shorter 24/7 shutdowns scheduled throughout. It’s worth noting again that when presented with these options throughout 2016 and 2017, Brooklyn and Manhattan residents voted overwhelmingly against them, in favor of a shorter work schedule with proper mitigation. According to my MTA sources, Cuomo has been pushing the agency for weeks to avoid a shutdown even as he has indicated the work is still required. It’s not quite clear why he wants to avoid a 15-month shutdown, but this will make the impact worse for everyone involved. Cuomo will address the public at 12:45, and we should learn more then. I will update this post with news as it develops. This is not a move that should be praised. In four months, give or take a few weeks, the MTA is finally going to shut down the L train between Brooklyn and Manhattan for Superstorm Sandy-related repairs. The looming closure is hardly a secret, and talk of the work and mitigation plans have consumed NYC’s transit realm for the past four years. I first wrote about the L train shutdown in late 2014, and it has since been the subject of numerous presentations, meetings, plans, reports, studies and even lawsuits. What was once supposed to be a 18-month shutdown has been whittled down to a 15-month sprint, and with prep work already well under way, the biggest concerns are about the effectiveness of the mitigation plan. The biggest concern, that is, until this week when Gov. Andrew Cuomo, once again in charge of the MTA, decided to step in. Until this week, Cuomo had been largely quiet on matters related to the L train shutdown. Content to let the city, his favorite transportation foil, bear the brunt of work (and criticism) over mitigation efforts that everyone expects to fail during the first morning rush hour on the first day of the shutdown, he hasn’t said much about the work. And then he went on Brian Lehrer’s show on Monday. For some reason, something or someone drew his attention to the L train shutdown, and on the WNYC show, he announced plans to tour the tunnel this Thursday with a team of “national experts, international experts,” as he put it, to determine if 15 months is the right amount of time for the work or if the MTA can speed up the plans. This announcement seemingly caught the MTA by surprise, and as late as Wednesday, the agency still had not announced the operations plan for Cuomo’s visit. We know he’ll be there at or around midnight on Thursday night, and we know the MTA is going to try to single-track L trains through the tunnel for around 90 minutes or so to accommodate the governor’s desire. He hasn’t told anyone which “experts” are coming with him, and it’s not clear how much of an assessment these experts can perform in such a short time period or whether this assessment is really just another infrastructure-related photo op. This thing reeks of a political stunt that it’s hard to know where to begin. And I actually had a gentleman come up to me who said, have you personally gone through it? And I said, no, I didn’t personally go through it, but that’s not what I do. He said, well they told you you couldn’t replace the Tappan Zee Bridge, right? I said, yeah, well that’s right. He said, but you did it anyway, right? I said, yeah you’re right. He said, well, why don’t you go look at these plans and bring the best people to look at the plans just so we know? And that’s that New York logic, right? Cynical, make sure you try everything. This might be one of those political ticks that doesn’t really matter, but it sure seems as though Cuomo is creating some straw-people to give him cover at this late date. Who knows who planted this seed? Cuomo often acts on his own based on his own impulses whether his advisers suggest he do something or not, and this may just be a situation where he doesn’t want to say that disrupting late-night L train service was his own idea. Lending further credence to this theory is the timing of it. One and off since the summer, the MTA has halted L train service between Brooklyn and Manhattan over the weekend to prep for the Sandy Fix-and-Fortify work. Had Cuomo wanted unfettered access to the Canarsie Tunnels, he could have gathered his groups of experts at any point over the past few months for hours upon hours of access to the tubes without inconvenience a bunch of people just trying to get home or get to work late at night. We’re assembling a team of outside the box thinkers who have nothing to do with government. They’re just international experts in tunnel construction and electric systems and I’ve asked them to come take a look just so New Yorkers have confidence that every option has been explored. I think if they know that they’ll feel better about the delay because they’ll know it wasn’t capricious, it’s not arbitrary, it’s not incompetence. Everything that can be done has been done and that’ll make me feel better on a personal level if nothing else. Imagine being the people at the MTA who have slaved over these plans for years, faced with the pressure of reducing the timeline as much as possible, just to Cuomo step in with a bunch of folks at the last minute to second-guess your work for a photo op. Perhaps the MTA hasn’t earned the benefit of this doubt, and heaven knows we can point to countless examples of ineptly managed and delivered MTA construction projects. But the Sandy work has been smooth and on time. There is no reason to think the L train work wouldn’t be, and anyway, the time to consult with experts was years ago and not months before the shutdown starts and after work has begun and contracts awarded. That Cuomo hasn’t even opened this event to press indicates to me as well that his experts are far from expert, but we’ll only find out from the MTA or Governor’s office (or if anyone stakes out either end of the L train tunnels to see who shows up with the governor on Thursday night). Ultimately, here’s what I think is happening: After two years of lengthy discussions, numerous studies and tons of public meetings, Andrew Cuomo is stopping L train service for some period of time so he can hold a photo op inside a tunnel that’s shutting down in four months. In a few weeks, the MTA will hold a press conference to announce that they’re going to try to finish the L train work in less than 15 months — perhaps, say, 13 months — but can’t make any guarantees. Cuomo, suddenly in charge of the MTA again, will take credit for the good news, and that will be that. It’s a blatant stunt with a clear endgame for no real reason, but make no mistake about it: Yet again, it’s a clear sign that Cuomo is in charge of the MTA, and the MTA will respond to his whim no matter the scope or impact on customers.